At about 4:00 am on Tuesday, September 11, Roblin RCMP received a call regarding a break-in at the local Esso. Surveillance images show two suspects throwing a rock at the door, destroying the window, and entering the building. 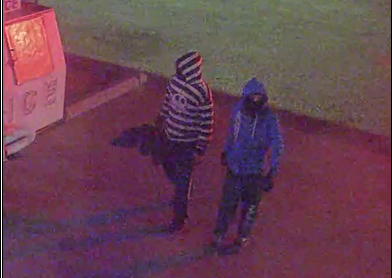 Police are looking to identify the two people in the above picture. Anyone with information about this incident is asked to call the Roblin RCMP Detachment at (204) 937-8054, or submit a tip .